Social media is both one of my favorite things in life and one of the most stressful things in life! But it’s a really good way to keep in touch with people and communicate and gain exposure! I have 2 announcements for all of you! 1. 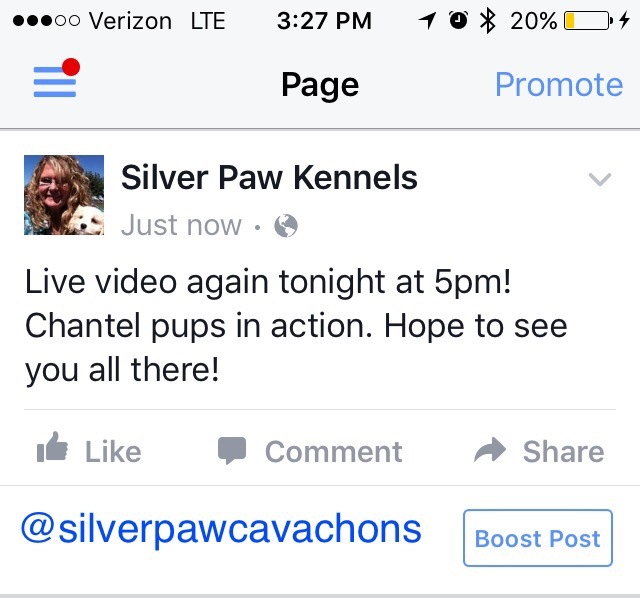 I will be doing another live video tonight at 5pm on our FB page. 2. I have opened an Instagram account for Silver Paw Cavachons. If you have Instagram, I’d love for you to follow @silverpawcavachons and post pictures of your furbabies with the hashtag #silverpawcavachons. I will also post photos on IG and try to communicate there as well! If you don’t have an IG, as long as you’re watching the blog and FB, you shouldn’t miss anything. See you at 5pm (PST) on FB for the video!